Summary: When other little girls were dreaming about becoming doctors or lawyers, Alex Garrett set her sights on conquering the high-powered world of Wall Street. And though she's prepared to fight her way into an elitist boys' club, or duck the occasional errant football, she quickly realizes she's in over her head when she's relegated to a kiddie-size folding chair with her new moniker—Girlie—inscribed in Wite-Out across the back. Entertainment Weekly is still one of my go-to sources for books, so when they gave BOND GIRL by Erin Duffy an A-, I just knew I had to read it. Plus, they did a cute little feature on the book and author take also piqued my interest. I'd like to think it's because I was interested in the subject matter -- many years ago I was a finance major and worked in the finance industry for a short time, but I think it just sounded like a very entertaining book. I am so glad I picked up BOND GIRL. I absolutely loved it, and I think I even surprised myself with my reaction. 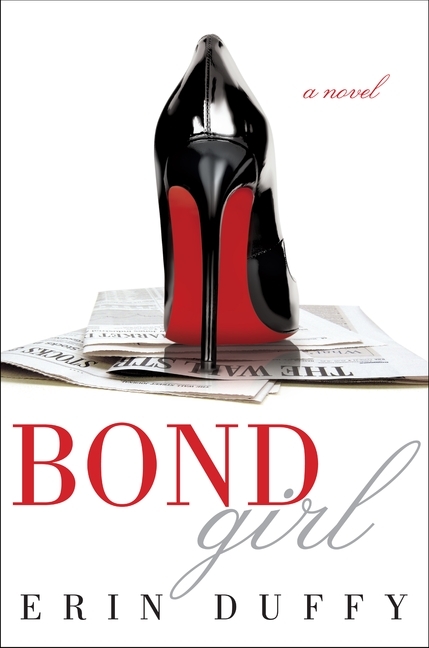 You might be thinking that BOND GIRL sounds a little bit like THE DEVIL WEARS PRADA; however, instead of taking place in the magazine industry, it takes place in the world of finance. You'd be right, but I have to say that BOND GIRL was much, much better! I thought this book was so well done; and as a result, so entertaining. The writing was very good and the book gave readers an interesting insight into the world of Wall Street; however, I think what made this book so special was the protagonist Alex. She was a fantastic character and I couldn't help but root for her. In addition, I just loved her voice -- she was extremely honest and also very funny. It was apparent that the author, Erin Duffy, had some some insider knowledge into the world of finance and banking. I'm sure parts of this novel were exaggerated to make it more interesting (or at least I'm hoping that's the case), but I swear many of the stories sounded as if they could have been. real. I laughed so hard at some of her boss and co-workers' action, and I was constantly in awe of the sheer excess and waste. There is no doubt that the finance industry is an entirely different world than what most of us have experienced! But BOND GIRL wasn't all fun and games. The book definitely had some substance. Of course, we all look back at the excess and cringe; and the book did explore the economic downturn and what eventually happened to many of the company's employees. But, I appreciated how the novel delved into Alex's psyche. At first, Alex was willing to do whatever it took (no matter how degrading) to be successful in her job; however, throughout the novel, she matured into a strong woman. She reassessed her goals and priorities and even learned to expect more from relationships. In so many ways, BOND GIRL was a coming-of-age story for Alex... and that's probably one of the reasons I loved it so much. I have a feeling at the end of the year, I might look back at BOND GIRL as one of my favorite reads. Highly recommended! Thanks to the publisher for sending a copy of this wonderful novel! Wow! This book sounds wonderful! You've made me very curious about the stories! I read about this in EW too! Sounds really good! I generally trust EW. They are usually spot on. I was in the corporate world, male dominated, for 15 years, so I always appreciate books that show the ugly side of what it is like to navigate it all as a woman. I have some elephant-sized baggage over that part of my life! I bet I would love this. This sounds like a really fun story! I love when books surprise you -- in good ways. I've read a few novels that even shocked me with how much I enjoyed them.